This is Facebook’s advertising slogan for the new Facebook Timeline, a different profile format that offers users the opportunity to sort and highlight life events chronologically. Students at Notre Dame — many of whom have been Facebook users since the site’s inception in 2004 — have mixed feelings about the new profile. 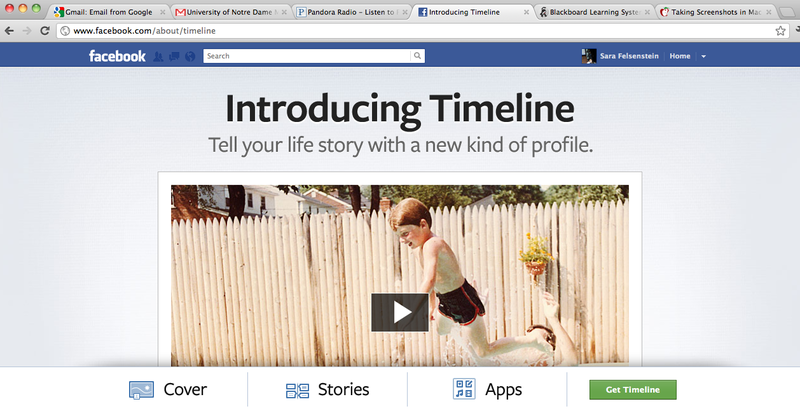 Sophomore Adam Lllorens agreed Facebook Timeline forces users to be more transparent about their pasts. Embarrassing or regrettable moments are no longer covered up by layers upon layers of wall posts — they are now accessible with the click of a button. But Iati said Timeline has definite upsides, especially in its visual appearance. Senior Elissa Cmunt said she also likes the banner photograph at the top of the page. Senior Grace Concelman, who still has the old profile, said Timeline is much too public. She said she is toning down her Facebook usage. Cmunt said she thinks Timeline is just one of Facebook’s many changes, and that most students have overreacted to it. While Timeline makes it easier for others to look into her past, Iati said, it has also caused her to be more aware of the digital footprint she leaves on Facebook. “It has made me more conscious of what I post because I know that people will be able to easily see it years from now,” she said. Take a photo. Photoshop. Upload to Facebook. The steps sound simple, but Notre Dame professors said more thought goes into the process than most people realize. Jessica Collett, assistant professor of sociology, said we are much more “intentional” in our online interactions with others. As a result, the effects of Facebook can extend far beyond online profiles and into people’s lives and relationships. She said others will often treat us according to the image of ourselves we present on Facebook. In turn, we act according to how we are treated. “If we have a preconceived notion about somebody, then we’ll interpret any kind of information in ways that support that [notion],” she said. Collett said Facebook also prompts us to define and categorize ourselves based on our interests. Susan Blum, a professor of anthropology who has studied the effects of new media on the “self” for the past decade, said Facebook can function to prove or validate occurrences in our lives. Blum said one of the potential downsides to using Facebook, or any similar social media site, is that it causes people to perform an exaggerated identity that may or may not be real. “I think there’s plenty of motivation to do that in our lives anyway, and so Facebook increases that tendency,” she said. Collett said these exaggerations of identity can trigger anxiety as relationships transition from the digital world to the real world. “Sometimes you can believe that what you’re presenting isn’t accurate … maybe you choose your most flattering picture, and then you meet people who maybe you haven’t even met in person yet, and then there’s just this stress [of] living up to expectations,” she said. Facebook use also becomes risky, Collett said, when digital identities are too calculated. “I think it can be dangerous … if people get too caught up in the way that they’re presenting themselves, and don’t have a space where they feel like they can be their authentic selves,” she said. Blum said she questions whether online interaction makes face-to-face interaction even more “scary” than it already is. But Blum said interactions on social networking sites can actually augment real life interactions. Anita Kelly, a professor of psychology who has researched the effects of public versus private self-representation, said what we choose to say publicly has a much greater impact on our identity than what we say privately. She said the public nature of Facebook is what makes it so influential. Collett said that on Facebook, we must live up to a multitude of identities because different “types” of friends see us in different ways. The question is, who will see that wall post or status update? Blum said college students usually think of their intended audience as their peers despite having a wide range of Facebook friends. Kelly said people should be more aware of just how much Facebook profiles impact the way others view us. “People should be more careful,” Kelly said. “There’s a mentality of ‘it doesn’t matter what people think,’ but no one [really] believes that,” she said. She said negative images posted on Facebook can be forgotten, but not if they are vivid. Blum said the extent of the cyber footprint we leave on Facebook is striking. “There’s a sort of a digital self that’s out there, and even though Facebook only started seven or eight years ago, it’s going to predate itself [for example] by finding our baby pictures that people have posted, so pretty soon our whole life and biography will be digitally mapped,” she said. She said psychologists and sociologists have conducted extensive research on the way Facebook affects identity, but the enormous amount of data Facebook houses is used in other settings as well. Collett said the new Facebook Timeline profile, which offers users the opportunity to sort and highlight life events chronologically, also makes it easier for users to look back on the past. And sometimes, looking back on the past lies outside our comfort zones. But regardless of how Facebook is formatted, Collett said the site still reflects our identity in much the same way.